Home Mobiles-Tablets India Telecom News India How to Extend Your Mobile Phone Battery life? 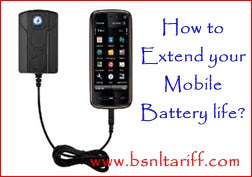 How to Extend Your Mobile Phone Battery life? Most of the Mobile users before going to bed they simply plug-in their mobile phone charger to power to get full battery on the next morning. Do you think this technique will extend your mobile phone battery or else damages? Mobile Experts claimed that don’t charge your mobile phone to 100 per cent, in order to extend your battery life then charge mobile phone about 50 percent instead of charging mobile phone battery full. How to Speed up your Mobile phone charging? Stop recharging Mobile phone through Power points? Technical expert Limer says, overcharging or having a full battery and going from down to zero does ongoing damage to mobile phone batteries. Limer also added that, Maintaining of mobile phone too hot by regular charging can cause it to lose power every year. Leaving phones connected to a charger after they are fully charged can spoil your mobile phone battery with high temperatures. Actual temperature for maintaining mobile phone is 15 degrees Celsius, and batteries on 25 degree Celsius temperature lose about 20 per cent of their power every year. Mobile users are advised to conserve battery life, turning mobile phones to flight mode in those areas where poor signal, shut down of apps that use GPS (Global Positioning System).